Whether you are looking for a solution to a horse problem, want to avoid a horse problem, or simply want to learn about effectively communicating with your horse, this set of videos is invaluable. Ellen Ofstad does not use 'quick fixes', but teaches fundamentals in addressing horses with problems. Ellen selected a handful of horses and their people who sought her guidance, and used these cases to demonstrate what can be done to enable and encourage the horse to do what we want. The videos are narrated in English and the comments of the riders are subtitles translated to English. 3.) visible and obvious changes in the horse after the human behavior has changed. 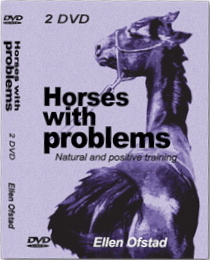 Ellen believes that horses with problems are not problem horses. Horses are cooperative by nature, so a change in a horse's behavior is readily accomplished by a change on the part of the human. Our approach and attitude make a difference to the horse, and Ellen explains that we often don't realize that what we are doing may actually be reinforcing behavior we don't want, or that physical problems (often in the rider as well as the horse) may be contributing to the behaviors. Insight from an equine bodyworker is included. Part 2 involves getting the horse accustomed to new and different things, and preparing the horse for riding. It includes ways to calm the horse, have the horse's attention, have the horse respecting our space, and being responsive. A segment on dental care is included with an equine dentist providing valuable information as one of the featured horses receives dental care. Ellen takes the viewer through the step-by-step process as she helps each horse's person to understand the horse's (and their own) body language, to recognize signs of tension and insecurity in the horse, and to change ineffective ways into effective ways of asking for various behaviors from the horse. 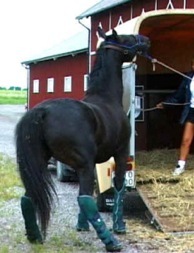 Difficulties addressed range from catching the horse to trailer loading to riding problems. At the heart of each solution is an understanding of the horse and using communication that the horse understands - largely, body language. Ellen explains that horses are more than willing to trust us to be their leaders; all we need do is lead them in a way that makes sense to them. By reading the horse's body language and seeing things from the horse's point of view, we can determine the causes of problems, solve them, and prevent many future problems as well. Training is an ongoing process, and the length of time needed for addressing problems and working out the solutions depends on various things, so it varies from horse to horse. In each of the situations presented, Ellen troubleshoots to find the real issues, demonstrates what the person can do so the horse understands and can comply, and then the person tries it. The results are astounding. It is heartwarming to see the changes in the horses in these videos as a result of new knowledge, time, patience, and dedication on the part of the people. Ellen makes the learning fun, and the riders can once again enjoy life with their horses. At the end of Part 2, the people are interviewed to reflect on their accomplishments and what was learned, giving the viewer insight into what it was like before and after arriving at this new level of horsemanship. "Horses With Problems" is an excellently produced set of videos that presents much more that just some common problems and sensible and effective solutions. Equine bodywork and equine dentistry are introduced, as well as insight into what, in most cases, are the causes of problems. The viewer also benefits from the very effective use of slow motion and stop action frames to zero in on the specific behaviors at precise moments that could otherwise go unnoticed. Ellen's teachings are not about correcting the horse as much as they are about helping the horse understand. This beautifully produced video set is one that belongs in every horse-hold, whether or not there seem to be problems! In this video you will see different horses that are considered problem horses. You will see what problems they had, what we did with them and how they progressed. Only by doing something with the cause, instead of the symptom, can one hope to find a permanent solution to any problem. To be able to help the horses we must understand how horses think and react. We must understand what is natural for a horse, and how to read it's body language. The owners of the horses in this video works with the horses themselves.